Home > Guitar News & Guitars > Are guitar starter packs any good? I often get asked the question are guitar starter packs any good? My initial answer is perhaps not that helpful as I think that it really depends on what you buy. Therefore I thought it would be good to look a bit deeper and try and provide a bit more of a definitive answer to the question – are guitar starter packs any good? First off what are guitar starter packs? Guitar starter packs are, as the name suggests, a pack that gives you everything that you would need to get you started playing the guitar. In terms of electric guitars, and let’s face it, it is mainly electric guitar starter packs that we are interested in, this will include the guitar and amp. As well as these two crucial items the starter pack may include accessories such as an electronic guitar tuner, tuition book, guitar strap, guitar bag and plectrums. The beauty of a guitar starter pack is that, for a very competitive price you get all that you need to get you up and running. For example I remember buying my first electric guitar, a beautiful second-hand Squier Stratocaster. The guitar cost me £130 which I thought was good value for the guitar, but this did not leave me enough money for an amp. It took me a further 3 months to save up for what was a pretty cheap and cheerful amp. That was over 20 years ago when guitar starter packs, as far as I am aware, were not even the seed of an idea in the marketing departments of the big guitar companies. Nowadays I can pick up a Squier Affinity Series Stratocaster starter pack which includes an amp and lots of other goodies for just £145 through Gear 4 Music. For a new guitarist who is keen to get started, but is on a tight budget, you don’t want to have to wait and buy all the equipment you need over a prolonged period of time. That is why the guitar starter pack is such a great idea. Why are guitar starter packs so cheap? 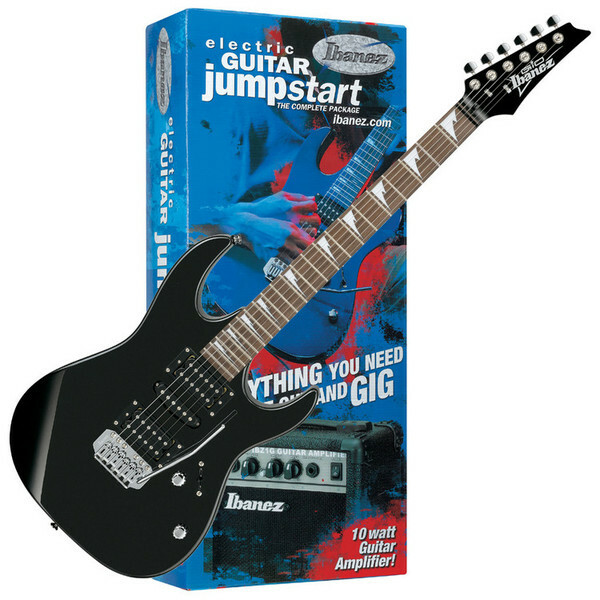 The Ibanez IJRG200E Jumpstart electric guitar starter kit is excellent value for money. Take a look at any guitar website and you will see guitar starter packs starting for as little as £80 – £100. You have to admit that represents excellent value for money. The big question is how can the guitar manufacturers sell them so cheaply? The answer lies in the mass production of cheap instruments in countries with a low cost of production, think China, Mexico and Indonesia. The materials used in the construction of the guitars will also be significantly cheaper. When we talk about the choice of hardwood for the body don’t expect Mahogany you are more likely to get Basswood or Agathis. The electrics will also be significantly cheaper so don’t expect top notch pick-ups. Also expect things like the strings, tuners and bridge to be cheaper all of course in order to reduce the cost of production. However, do not be put off, although cheaper materials will have been used in their production the guitars in starter packs will be functional and should provide a trouble free playing experience. I also have one other suggestion as to how the guitar manufacturers can afford to sell these guitar starter packs so cheaply. Undoubtedly the guitar manufacturer does not make a lot of money, if any, on their guitar starter packs. But if you have a good experience with their product there is a strong possibility that you will remain brand loyal and stay with that maker for your next guitar when you come to up-grade. So for example when it comes to trading up from your Squier Affinity Series Strat you might move on to a Squier Classic Vibe Strat or even a Fender Standard Strat. I don’t think it is a vast leap to suggest that guitar starter packs are used as loss leaders to encourage brand loyalty. Well that is my theory anyway. But are guitar starter packs any good? Well as with anything in life you get what you pay for. Undoubtedly if you pay a little bit more you will get a better starter kit but there are some very good guitar starter packs that you can pick up for under £150. Take for example the Squier Affinity Series Stratocaster starter pack. This is an excellent starter guitar with a very good 10W practice amp all for £145. However the cheap end of the market is dominated by manufacturers such as Rockburn and Encore who are well known for producing budget guitars which are actually not too bad. Therefore the starter kits that are produced by these two companies are actually very good. In fact on the Amazon best sellers list Encore and Rockburn guitars are the top 5 best sellers. Don’t forget the materials used to produce these guitars will be cheaper but this does not mean they will be poor quality guitars. There is no doubt in my mind that guitar starter packs represent excellent value for money. The guitars are produced from cheap raw materials but are generally manufactured to high standards. So in answer to the question are guitar starter packs any good I would have to say generally yes they are. However, if you buy one check out the reviews on websites such as Amazon as they can highlight which guitar starter packs are worth buying. To help we have a couple of articles which look at some of the best guitar starter packs.